slope the trench 1/4 inch per foot. This is the grade at which sewage flows freely through a pipe and provides proper scouring action to keep the sewage flowing. When a pipeline is to be laid in stable soil, such as hard clay or shale, the trench should be excavated below the pipe grade. If bell-and-spigot pipe is to be used, excavation must be made for the bells. See that enough undisturbed earth remains at the bottom of the trench, so the pipe, both joints and hubs, rests on and is fully supported by undisturbed earth. In areas where the temperature drops below freezing, the trench must be excavated deep enough for the pipeline to be below the frost line. Pipes that cross under roads or areas of vehicular traffic must be buried in trenches at least 4 feet deep and may require some type of metallic sleeving. Refer to the specifications of the job for details on sleeving pipe. The sides of excavations, 4 feet or more in depth or in which the soil is so unstable that it is not safe at greater depths, should be supported by substantial and adequate sheeting, sheetpiling, bracing, shoring, and so forth, or the sides should be sloped to the angle of repose. Surface areas adjacent to the sides should be well-drained. Trenches in partly saturated, filled, or unstable soils must be suitably braced. Among the pipe materials installed underground by Utilitiesmen are cast-iron soil pipe, vitrified clay pipe, concrete pipe, and plastic pipe. Cast-iron soil pipe and fittings are composed of gray, cast iron that is made of compact, close-grained pig iron, scrap iron and steel, metallurgical coke, and limestone. Cast-iron soil pipe is used in and under buildings, protruding from 2 to 10 feet from the building. (The National Standard Plumbing Code-Illustrated recommends at least 3 feet.) Here it connects into a concrete, plastic, or clay house sewer line. Cast-iron soil pipe is also used under roads or other places of heavy traffic. When the soil is unstable, it is better to use cast- iron soil pipe; however, cast-iron soil pipe should not be used in soil containing cinders or ashes; the reason is that the soil may contain sulfuric acids, which cause the pipe to corrode and to deteriorate rapidly. When the soil contains cinders and ashes, instead of using cast-iron soil pipe, use vitrified clay or plastic pipe. The cast-iron soil pipe used in plumbing installations comes in 5-foot and 10-foot lengths. Sizes of cast-iron soil pipe are 2, 3, 4, 6, 8, 10, 12, and 15 inches nominal inside diameter. It is available as single hub or double hub in design, as shown in figure 3-2. Note that single-hub pipe has a hub at one end and a spigot at the other. 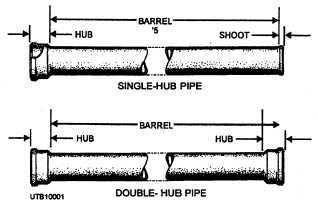 The double- hub pipe has a hub at both ends. Hubs, or bells, of cast-iron soil pipe are enlarged sleeve-like fittings. They are cast as a part of the pipe and are used to make a water- and pressure-tight joint with oakum and lead. Cast-iron soil pipe is generally available in two weights: standard or service (SV) and extra heavy (XH). The extra heavy pipe is used where superior strength is required, for example, under roadways, where the pipe may vibrate or settle slightly, and tall stacks. Standard or service weight pipe is adequate for most Navy base construction. Figure 3-2. - Single-hub and double-hub cast-iron soil pipe.